Feeling low? Is Stuff On My Cat just not cheering you up any more? 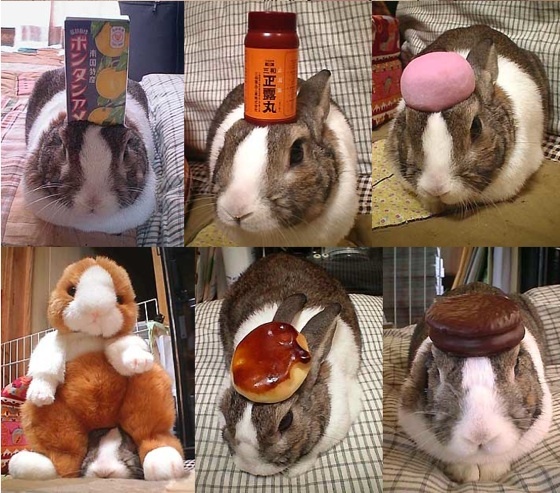 Perhaps you need to move on to In Almost Every Picture 8, a collection of images taken by one Japanese man of his rabbit balancing an array of items on his unusually flat head. It's hard not to enjoy seeing the fluffball hold up drinks and desserts --unless you're in PETA. No tricks just getting on and learning how to ride on a road or bunny hill. Which one requires more work, skill, balance to just ride 30ft. So how much money does the late Oolong's owner get from this book? OMG! the Cutest thing ever! I miss Oolong! I adopted a bunny that was very similar to Oolong and named him flapjack (for one of the first pictures I saw of Oolong (with the 'pancake'). RIP Oolong... :'( i'm sad now.. i love bunnies, i always enjoyed Oolongs antics..